Botella L, Bačová A, Dvorák M, Kudláček T, Pepori AL, Santini A, Ghelardini L, Luchi N (2019). Detection and quantification of the air inoculum of Caliciopsis pinea in a plantation of Pinus radiata in Italy. iForest 12: 193-198. Caliciopsis pinea has been historically described as a secondary pathogen of pines. However, it has recently been associated with severe damages on Pinus radiata in Italy. Our study focused on the description of the seasonal spore dispersal of C. pinea and its relation to meteorological conditions (temperature, leaf wetness, relative humidity and precipitations). For this experiment one infected P. radiata plantation was sampled in Tuscany (Italy). A rotating arm spore trap together with a weather station were installed to sample the aerospora for 24 h every week from May to November 2016. Exposed tapes from spore traps were directly analyzed after DNA extraction by qPCR using specific primers and TaqMan MGB probe. The study shows an irregular occurrence of the inoculum of C. pinea throughout the whole sampling period with peak levels in mid-June and early August. The statistical analysis of the DNA and climatic data clearly show the strong influence of precipitation on the spore production of this pathogen. Furthermore, the very low detection limit of the qPCR experiment shows the efficacy and suitability of rotating arm spore traps for early detection of this pathogen. Detection of plant pathogen spores of economic significance on pollen trap slides. Journal of Phytopathology 161: 855-858. Occurrence of Caliciopsis pinea Peck on pine: interactions with other fungal pathogens. In: Proceedings of the IUFRO meeting WP 7.02.02 “Foliage, shoot and stem diseases of forest trees”. Brno (Czech Republic) 20-25 May 2013. Mendel University. Brno, Czech Republic pp. 33. Hymenoscyphus fraxineus mitovirus 1 naturally disperses through the airborne inoculum of its host, Hymenoscyphus fraxineus, in the Czech Republic. Biocontrol Science and Technology 27: 992-1008. Detection and quantification of airborne inoculum of Hymenoscyphus pseudoalbidus using real-time PCR assays. Plant Pathology 63: 1296-1305. Field inoculations of Caliciopsis pinea and Diplodia scrobiculata on eastern white pine. In: Proceedings of the “Southwide Forest Disease Workshop”. Greenville (SC, USA) 29 June-2 July 2009. USDA Forest Service, Forest Health and Protection, Asheville, NC, USA, pp. 13. Contribution à l’étude du Caliciopsis pinea Peck: résultats complémentaires d’inoculations artificielles [Contribution to the study of Caliciopsis pinea Peck: complementary results of artificial inoculations]. Annales des Sciences Forestières 26: 285-295. Detection of airborne inoculum of Hymenoscyphus fraxineus and H. albidus during seasonal fluctuations associated with absence of apothecia. Forests 7: 1. Spore dispersal patterns of Fusarium circinatum on an infected Monterey pine forest in north-western Spain. Forests 8: 432. Revisionary studies in the Coryneliaceae. Mycologia 34: 464-488. Studies in the genus Caliciopsis. Canadian Journal of Botany 41: 503-543. Extensions of the host ranges and distribution of Caliciopsis species on western conifers. Plant Disease Reporter 48: 677-678. Variation in rates of spore deposition of Fusarium circinatum, the causal agent of pine pitch canker, over a 12-month-period at two locations in northern California. Phytopathology 98: 137-143. Rough bark diseases caused by Caliciopsis spp. In: Proceedings of the IUFRO meeting WP 7.02.02 “Foliage, shoot and stem diseases of forest trees”. Corvallis (Oregon, USA) 13-19 June 2004, pp. 36. Note sur une espéce cryptogamique nouvelle pour la France sur différents pins dont le pin maritime des Landes [Note on a new cryptogamic species for France on different pines including the Landes maritime pine]. Revue Forestière Française 1: 34-41. Pinus radiata: a narrow endemic from North America takes on the world. In: “Ecology and Biogeography of Pinus” (Richardson DM ed). Cambridge University Press, Cambridge, UK, pp. 432-449. Caliciopsis canker: a damaging disease on plantations in Italy. In: Proceedings of the Joint IUFRO 7.02.02 “Foliage, shoot and stem diseases of forest trees” and 7.03.04 “Diseases and insects in forest nurseries” meetings. Uppsala (Sweden) 7-12 June 2015. Swedish University of Agricultural Sciences, Uppsala, Sweden, pp. 21. 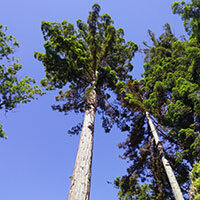 Duplex real-time PCR assay for the simultaneous detection of Caliciopsis pinea and Fusarium circinatum in pine samples. Applied Microbiology and Biotechnology 102: 7135-7146. The morphology and development of Caliciopsis pinea. Mycologia 28: 188-196. Pinus radiata D. Don, Pinaceae, Pine Family. In: “Silvics of North America, vol. 1. Conifers” (Burns RM, Honkala B eds). Agriculture Handbook 654, USDA Forest Service, Washington, Dc, USA, pp. 433-441. Extent and severity of Caliciopsis canker in New England, USA: an emerging disease of eastern white pine (Pinus strobus L.). Forests 6: 4360-4373. Soil and stocking effects on Caliciopsis canker of Pinus strobus L. Forests 7: 269. A rotary inertial impactor for sampling giant particles in the atmosphere. Atmospheric Environment 4: 9-19. The rotorod sampler. Second Semi-Annual Report No. CML 186, Aerosol Laboratory, Stanford University, CA, USA. R: a language and environment for statistical computing. R Foundation for Statistical Computing Vienna. Pathogenicity and cultural experiments with Caliciopsis pinea. Mycologia 28: 201-208. Caliceae. Rabenhorst’s Kryptogamen Flora 3: 382-414. Plant pathogen evolution and climate change. Series “Perspectives in Agriculture, Veterinary Science, Nutrition and Natural Resources”, vol. 35, CAB Reviews, Wallingford, UK, pp. 10. Invasive plant species of the world: a reference guide to environmental weeds. CAB International, Wallingford, UK, pp. 548. Dothistroma needle blight, weather and possible climatic triggers for the disease’s recent emergence. Forest Pathology 46: 443-452.